Between the head-offices of Philip Morris, Nestlé and Tetra Pac in Lausanne, there is an international community, where 10yearolds have two or three passports, credit cards and msn-messengers, oversea-friends and diplomatic vocabularies. They know how to book a flight on Internet to meet grandma on eastern-holiday in New York, but they hardly go to the centre of Lausanne. In the centre of Lausanne they might meet children without passports. Children whose parents are in Africa. Children who live in foyers been taken care by educators. In words of the International School’s director: ¨ there is a new generation of global nomads or third culture kids who don’t consider themselves as part of a particular culture because they have their own culture¨. They live in small communities, temporarily far away from their parents or their original countries. Simulating families in small groups. Which is the home or the patria of these kids? How many days do they need to forget friends who move away and make new friends? How many of them will become top-managers of international companies, the new leaders of the World, the new refugees, homeless, embassadors? In summer 2007 international children from 7 to 13 years old started working with Lola Arias and Stefan Kaegi on the idea of such a “third culture”, inventing answers like fiction. First characters and texts were developed. Short plays of their own biographies in some dozens of air transport boxes to be used as transportable houses, forests, drum-machines, offices. The boxes are connected by skype-alike camera systems. 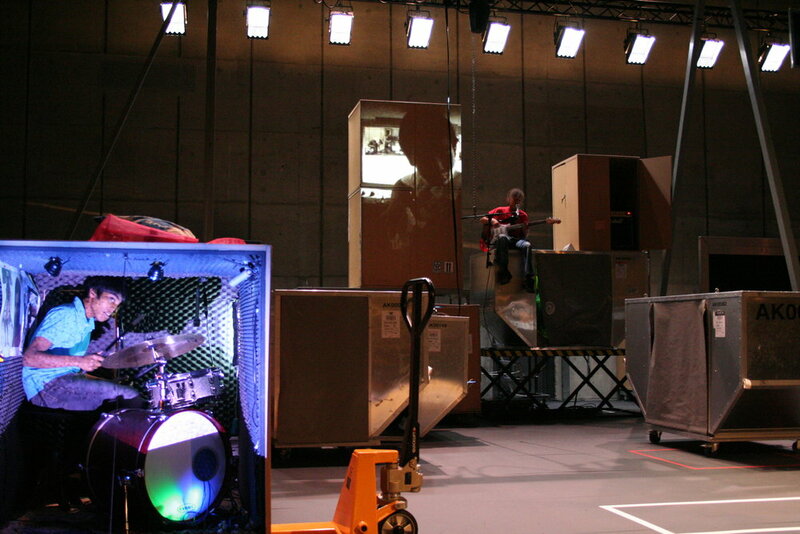 Sometimes piled up to form the different layers of a city or a stage for a rock band. Sometimes the boxes stay out alone in transit.